- On the back is a small motif that simply says "Celtic". One of the first few shirts that I added to my collection. The lime green colouring of this shirt is certainly something that you cannot ignore. The diamond pattern on the front of the shirt is an interesting design which adds a whole new dimension to the shirt. I do like how well the black trims work with the main body of the shirt, though I must admit that I am not totally sold on the green as a whole. Give me the green and white hoops of Celtic any day. The Lisbon Lions is the nickname given to the Celtic team that won the European Cup at the Estádio Nacional near Lisbon, Portugal on 25 May 1967, defeating Internazionale 2–1. All but one member of the 15 man squad were born within 10 miles of Celtic Park Glasgow, Scotland. 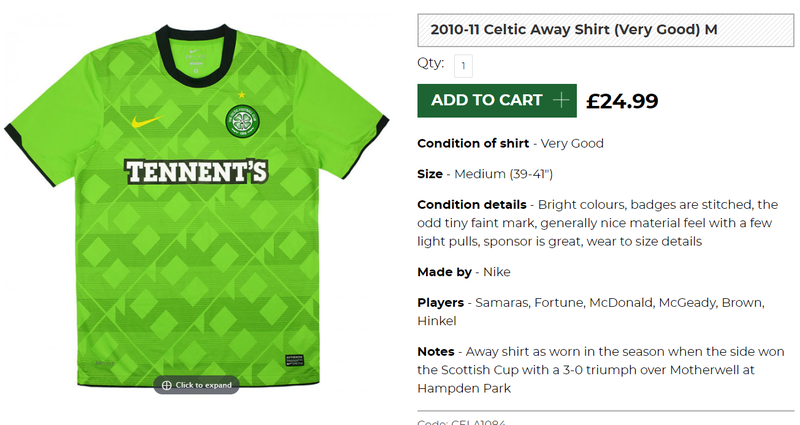 If the above has given you some inspiration to buy a Celtic shirt then why not buy one of theirs from this season. Clicking on the photo will take you to the retailer.